Welcome to Dove Cameron Online at dove-cameron.net! We're a fansite totally devoted to the the american actress and singer Dove Cameron. Here you will find all the latest news, images, videos and information on Dove and her continued career. If you have any questions, concerns or donations please contact me and you will get full credit. Please remember that we're not her and we don't have any contact with Dove or anyone related to her. We hope you enjoy your stay! Dove Cameron Online is an unofficial fansite. We have no contact with Dove, her friends, her family, representatives, etc. This site is made by fans for the fans. All images in the gallery belong to their respectful owners and no copyright infringement is intended. If anything belongs to you, please contact us and we�ll remove it. Join Dove cameron Network’s team! We decided to add people to the team! We’re missing bunch of stuff from the gallery and we need help to post news too. If you love Dove and want to be a part of our team, keep reading! We’re in need of Gallery Manager and Newsposter. Gallery Manager: You will help us to update our gallery with the HQ images of Dove Cameron. Newsposter: You will help us post the daily news on Neens, such as interviews and gallery updates. • Know how to use the Coppermine gallery? • Why do you want to be a part of dove-cameron-net? IMPORTANT: Remember that’s NO money involved. We do this for Dove and because we love her. Good luck to everyone! IMPORTANT #2: If you want to help us on our gallery, you MUST know how to upload pictures and have access to pictures in HIGH QUALITY. 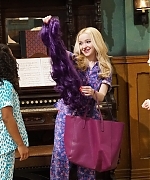 In 2012, she left her Glee-like days behind to lead a double life, starring as identical twins Liv and Maddie Rooney on the Disney Channel series Liv and Maddie. Cameron considers herself a musical theatre buff at heart, but television took the reins during her teenage years, so she’s thrilled to be starring as Amber Von Tussle in NBC’s December 7 broadcast of Hairspray Live! Just as she was a huge fan of Hairspray, Cameron began to experience the fandom that comes with life as a Disney Channel star. She’s also been in the Disney Channel film Descendants, about the children of Disney villains, in which Kristin Chenoweth played her mother Maleficent; the two will play a mother-daughter duo again in Hairspray Live! The final season of Disney Channel’s hit series Liv and Maddie, which stars Dove Cameron as identical twin tweens, is changing its appearance for its last hurrah. EW has learned the fourth season (premiering on Sept. 23 on Disney Channel) comes with a twist: You’ll find it on your DVR under the new title, Liv and Maddie: Cali Style. Cast members Joey Bragg, Tenzing Norgay Trainor, Kali Rocha will also return for the final season. Dove Cameron, who plays both title characters on Disney Channel’s Liv and Maddie, and Teen Beach Movie‘s Garrett Clayton have joined the cast of Hairspray Live!, NBC’s live musical produced by Universal Television that will air December 7 from Los Angeles. She will play Amber Von Tussle and he is Link Larkin. Cameron and Clayton join Harvey Fierstein, Jennifer Hudson, Ariana Grande, Kristin Chenoweth, Martin Short, Derek Hough and newcomer Maddie Baillio. Based on the Tony-winning Broadway musical, Hairspray Live! takes place in 1962 Baltimore, where teenager Tracy Turnblad (Baillio) dream of dancing on The Corny Collins Show, a local TV program. When, against all odds, Tracy wins a role on the show, she becomes a celebrity overnight and meets a colorful array of characters. Along with Liv and Maddie, which wrapped its third season in June, Cameron plays Mal in Disney Channel’s Descendants franchise. Her credits also include Barely Lethal and TV’s The Mentalist and Shameless. Clayton co-starred in Disney Channel’s Teen Beach Movie and its sequel. He also appeared on The Fosters and The Real O’Neals and has the features Don’t Hang Up and Welcome to Willets up next. Make You Stay – The Girl and The Dreamcatcher | HD Screen Captures!